Did you know that corn is promiscuous? Don’t be too shocked. This monocot is very happy to out cross the very moment you fail to protect its innocence. Corn, as most of you know, is a monocot. 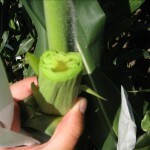 Corn can self pollinate or it can out cross, or get pollinated by another corn plant. It does this so readily in large cornfields that, uncontrolled, the seed that results will be widely different in both its agronomic and genetic traits. In cash grain fields this is not a problem, however, in research, we spend a large part of our time preventing out crosses. For the past month I have been protecting my corn’s innocence! I have been covering up little ears with shoot bags to keep invading pollen at bay. Then when the silks have grown out we are able to make the necessary crosses to bring out specific desirable traits. Doing this is quite labor intensive and time consuming, hence the entire months work devoted to just this task! Despite the hard work, this is undoubtedly the most important aspect of our research project. If we mess this up, we don’t have corn to plant out for next years research. Cover the ears with shoot bags before they have a chance to silk. 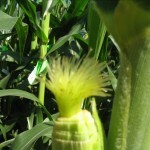 Wait for the tassel to begin shedding pollen. 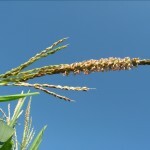 Once the tassel has begun to shed, place a tassel bag over the tassel to collect pollen for tomorrows pollination. 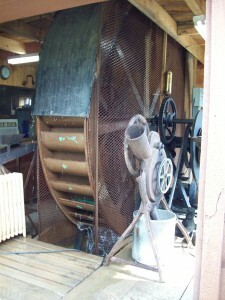 At the same time cut back the respective ear until you see silks. These will grow out over night to leave a little silk bush for you to dump your collected pollen on. Cover Up IMMEDIATELY! and needs warm weather to be viable!) 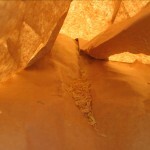 You will then shake that bag of collected pollen out onto the silks of the ear you wish to pollinate. Once again, cover up that ear with the remaining tassel bag to prevent any stray pollen from sticking to your silks. Done! You now have a hand pollinated ear. It’s been a while since I blogged and I want to apologize to all. It’s been so hard for me to get used to living without internet in my new apartment, not to mention that the library is only open during my work hours and I never make it back from the field before it closes. Needless to say, I drafted this post back in July. Hope it’s not too late! Hole Punching Tissue. A tedious by necessary evil! Remember last time I’d mentioned that I loved the snip and slip method of collecting tissue…well, I may retract my statement. We used that same tissue and hole punched it into tubes in preparation for tissue grinding and chloroform extraction of DNA. The little steel balls are the best part of that whole process. If you have steady hands and don’t mind them bouncing all over like tiny marbles you might be able to get through the process. Interestingly enough, Jesse, our senior graduate student freeze dried the tissue before we had to punch holes with it. This made the process so much more efficient. No more tissue sticking to punchers, no more iron corn leaves that refuse to yield their tissue, just perfection. In addition to the never ending adventure of tissue, we’ve now been rowbanding. 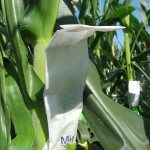 Rowbands are colored cardboard with stuck on labels identifying each specific row or corn plant. 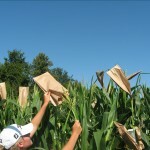 This helps us keep track of the specific corn and makes data collection a breeze. These labels even have both a linear and a 3-D barcode on them. Our scanners can be transported out to the field and can automatically collect the data for you by scanning in or typing in your information for a specific plant. 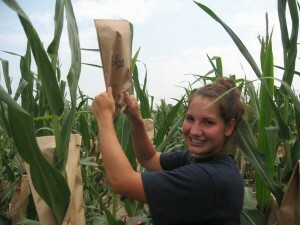 Myself and the other two undergrads have been diligently sticking labels and row banding the corn plants so that we are better able to keep track of it! 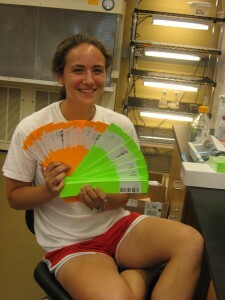 Sara, another undergrad, fanning out our rowbands. Everybody has heard of Round Up Ready technology and a lot of people think that it is great. And it is great. However, there are certain limitations to the technology that people should be aware of. Glyphosate (Roundup, Touchdown) is what is known as a burndown herbicide. The molecule is absorbed through foliage and is translocated to the growing points of the weed where it inhibits amino acid synthesis. Because it requires growing plant tissue to work, glyphosate has no residual effect. So, any weeds that emerge after glyphosate is applied are safe from its effects. This means that multiple applications of glyphosate are usually required to keeps crop areas free of weed. 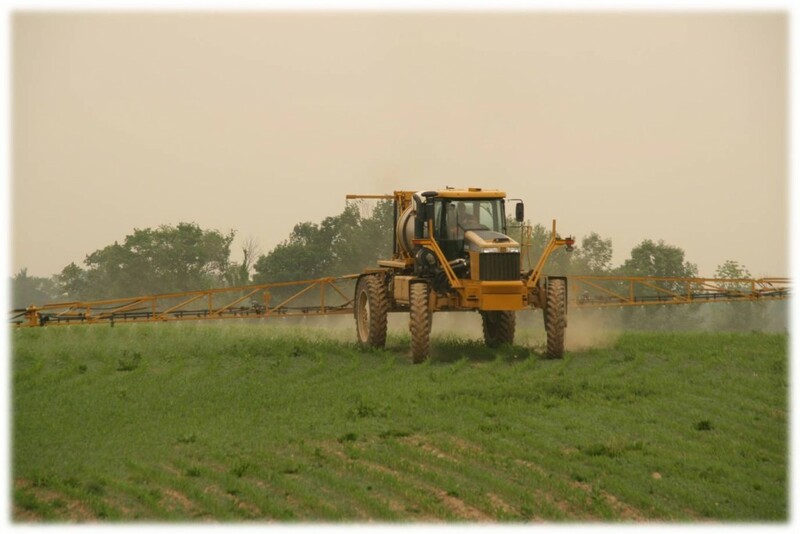 Weed control can be greatly improved by combining glyphosate (or another burndown herbicide) with a chemical (such as atrazine or S-metolachlor) that has residual action. 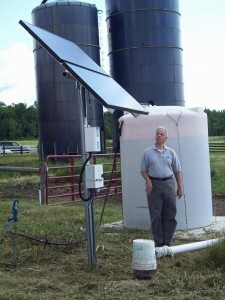 This system not only kills weeds that are present, but prevents the germination and emergence of other weeds. Now remember that certain chemicals are labeled for certain crops, so be sure that you read the label before applying anything. Also note that glyphosate technology only works with crops that are specifically engineered to be resistant to glyphosate. 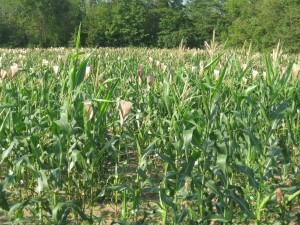 So if you are going use glyphosate on your corn, make sure that it is glyphosate tolerant or your will be very sorry. For the past two weeks the Nelson Lab has been filled with rust and tissue. But listen, don’t get this confused with the kind of rust from the bottom of your car or tissue you use to blow your nose! Tissue collection is a very important aspect of any genetic analysis. It is collected in many different styles and performed for many reasons, as I learned the hard way this past week. 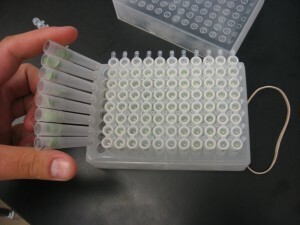 Many of the tissue samples I collected from the nursery stock will be used simply to see which plants must be cross pollinated to create the next generation with a desired trait. These we collect into tiny plates, being sure to clean our tweezers off on our cloth between every pluck of sawdust size tissue. I later aided the grad students with the DNA Extractions of this same tissue where we got a quick lesson in SNP’s and SSR’s. SNP’s can be performed much quicker than SSR’s and the information is shown as a cluster in a computer generated graph rather than the tough to analyze peaks of the SSR’s. Then we had to hole punch one piece of tissue out of each plant in the row to get the row average of specific recombinant inbred lines. These we loaded into Costar tubes, which apparently work well to create a DNA that will, as the grad students say “LAST FOREVER,” which is quite ironic as collecting that tissue TAKES FOREVER! The last type of tissue collection I will discuss is one that i enjoy the most. No bending over for hours. No hole punching. Just grab some scissors and snip it! This tissue we collected into small envelopes for later use. After all this tissue collection I was glad to switch to rust duty. I learned that Rust is a biotroph. This means that it needs a live host to grow and sporulate. 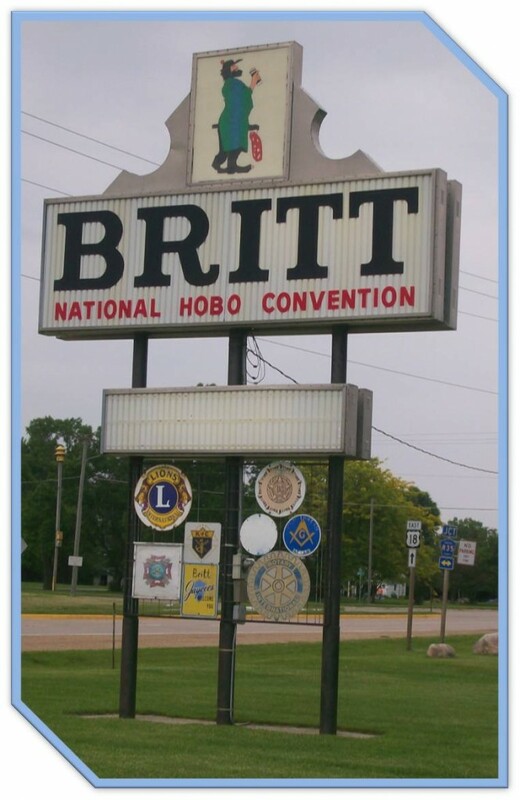 This is very different from the Northern Corn Leaf Blight cultures I am accustomed to. NLB is a necrotroph meaning it grows on a host and kills it in order to utilize the dead tissue, making it very convenient to culture in a lab on Petri plates. Since we have a large amount of plants in a trial searching for rust resistance on a specific QTL, we cultured our rust on live plants in the greenhouses here at Cornell. By using this QTL selection method or Quantitative Trait Locus we can essentially practice selection for a number of generations until the desired phenotype for the quantitative trait is identified. Once the rust was spreading on our flats of sweet corn we carefully collected the leaves and rinsed them in water to collect the spores. After a spore count we diluted spores into a liquid inoculum. We then trucked out to the field to inoculate the corn with our usual repeating pipetters.